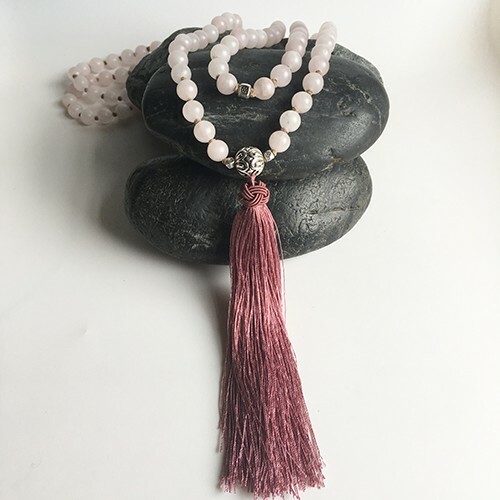 Join us for this inspiring class, and make yourself a gorgeous Mala-inspired Knotted Gemstone Tassel Necklace that has a sense of earthy richness - warm brown waxed linen, dusty matte gemstones in a comforting palette, a sumptuous silk tassel, distressed silver beads. With all these goodies, you'll create a knotted Mala-inspired necklace that you can design to the traditional 108 bead length, or longer or shorter as you wish! This on-trend, ever-wearable necklace with a spiritual vibe is just the perfect piece to perk up your favorite dress, breezy tunic, or perfect-fit jeans. Knotted Necklaces are the perfect style to use when creating Healing Jewelry, if you are so inclined. You can set an intention, say a prayer, or just focus on Love with each knot you tie - it's a Simple technique, but Powerful!